Iron, when mixed with small amounts of carbon results in steel; a strong and unyielding material. In this piece, the artist attempted to obfuscate the true nature of steel so that it might evoke instead a sense of fluid wind currents, swirling aimlessly in ever changing eddies. Turbulence is formed from parts, comprised of mild steel which were forged with heat and hammer and joined with MIG welding. The design was a fluid process and developed as each part was shaped and added. On some occasions, new aesthetic opportunities appeared and demanded change by the application of fire and of force. Turbulence was made by Cliff Bohm who sustained only minor injuries during its creation and, who is solely responsible for its content. 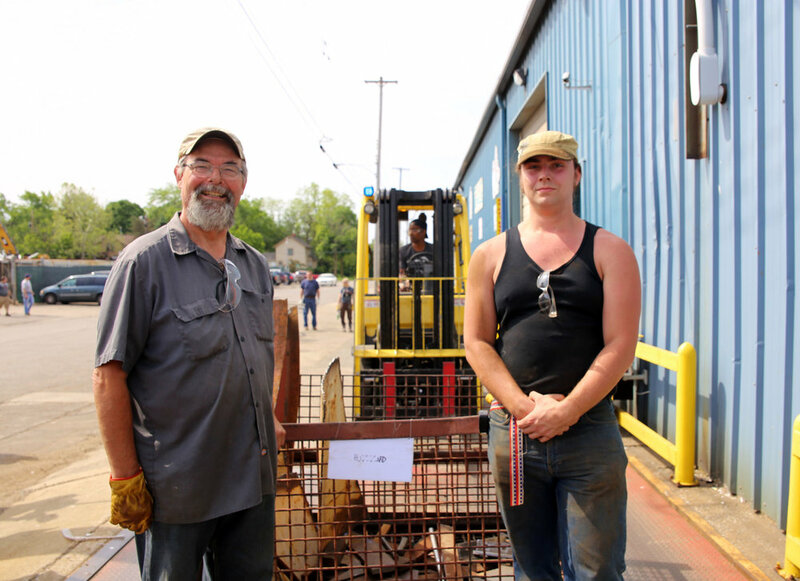 After many years going to Scrapfest as observers, we decided to take the leap and see what it’s like on the other side. 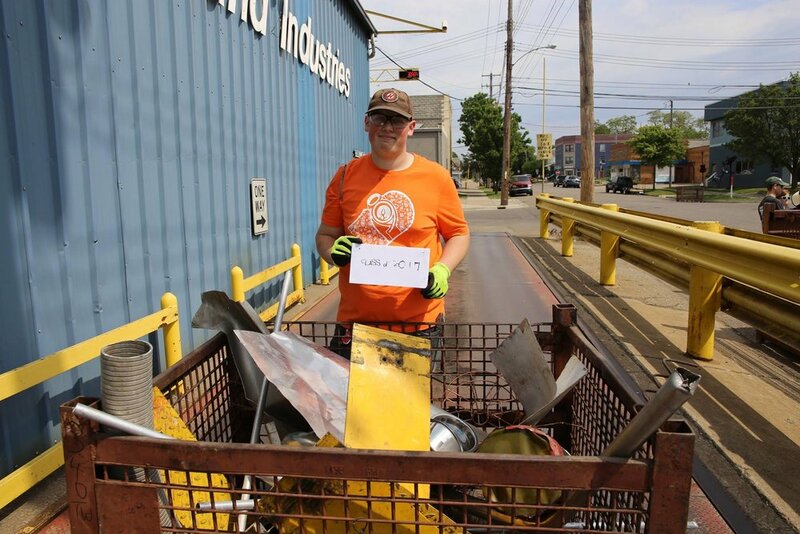 From the very beginning we could see why so many artists return year after year, I mean what kid (or adult) hasn’t dreamed of digging in the treasure trove of infinite possibilities known as a scrap yard! Now it was onto the fun, taking the treasures acquired on collection day and figuring how to transform them into a sculpture that we all agreed upon-some may call this the first battle haha. We decided on building our interpretation of an armored gladiator and his chariot. From a drum symbol turned shield to an hd satellite dish hammered into shoulder armor, the numerous pieces of scrap slowly transformed. We have learned so much in our first year and hope to earn our way into becoming regulars. We already had mad respect for the artists of past events and having now participated that has grown immeasurably. Taking inspiration from the Japanese art of Bonsai, team Artistic Iron is proud to present "Sakura". 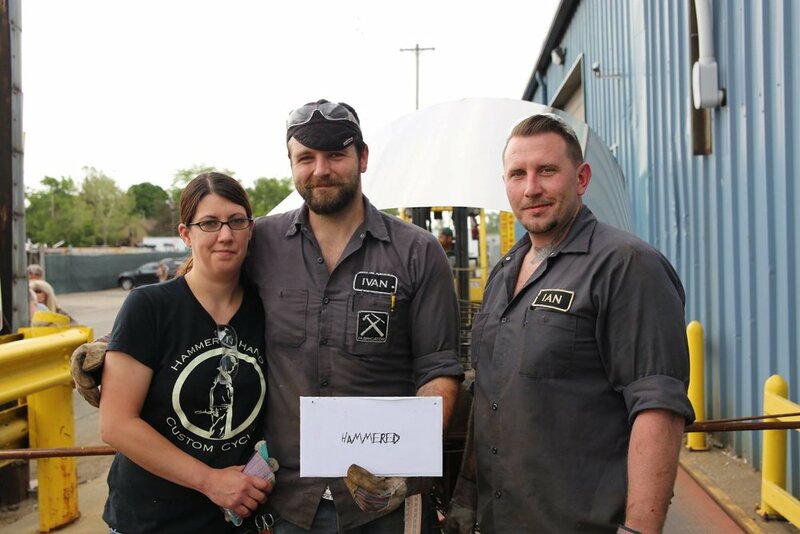 Although a new team to this years event, Artistic Iron brings three veteran Scrapfest artists together in an exciting combination of skills and talents. 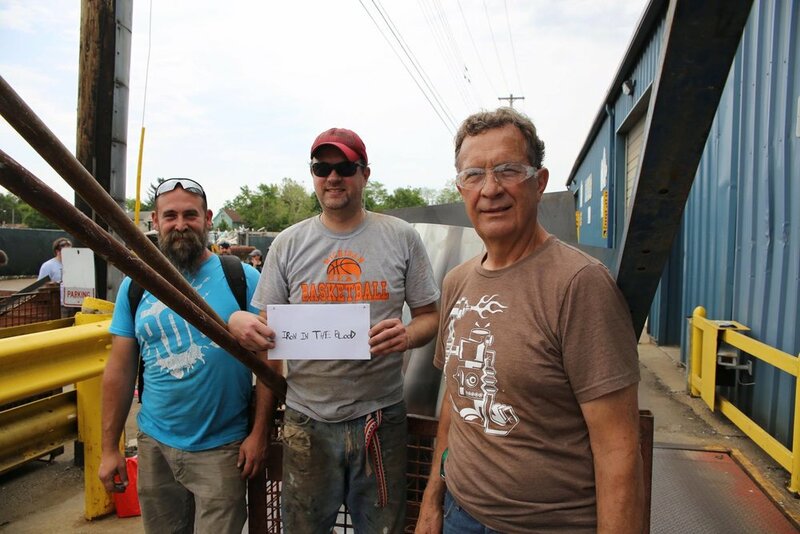 A true collaborative approach was taken on this years build. A clear and concise plan was formed early on, yet flexibility was maintained throughout the process. A deliberate design coupled with a strategic approach on collection day paved the way for maximizing a synergistic build, resulting in a sculpture that surpassed all of our expectations. Following the traditional methods of bonsai gardening, Sakura was constructed and is displayed to emphasize a "front" side. This approach encourages the viewer to fully engage on the subject while fostering an atmosphere to focus and contemplate. Over 350 individual pieces form the 70+ flower blossoms that adorn the branches. Precisely cut from sheets of stainless steel, the flat flowers were then all individually hand crafted to their final form. This process gives each flower a unique signature and design. The stamens are fabricated from three individual hand forged pieces of steel rod, each one heated and shaped separately. The tree trunk and limbs were constructed from six pieces of rectangle diamond plate. In the end, this translated to over 50 pieces of cut and welded steel to form one structure. Initially flat, the trunk and all the limbs were heated and bent to create depth and movement. Also following bonsai tradition, the container base has straight sides and sharp corners to complement the formal shape of the tree. Instead of shying away from the "Tesla" logo and circles removed from the original manufacturing process, the choice was made to incorporate them into the design. The zigzagging pattern found in the steel that was once a heat exchanger creates the perfect raked sand effect of a zen garden. The process of growing a living bonsai takes years, if not decades, to reach a final and mature form. This takes dedication, perseverance, and patience; much like a Scrapfest build. It's the daily discipline of the little things that create the eventual one big thing. We hope you will take a few moments to step back, contemplate, and enjoy Sakura. Life is a mystery. We're conscious that we exist but the pain of knowing ourselves is what we run from. It's a paradox of self awareness. We try to escape this life, but, we don't know who we are so we run without direction, purpose or meaning. In our fears we reach for what isn't there. We become trapped by our own insecurities and desires which causes us to try to control others as they do the same. It all becomes vain. The only thing we've ever needed is each other, but, the fear to search for who we really are causes us to protect ourselves from reality. Your true reality is when you find yourself! 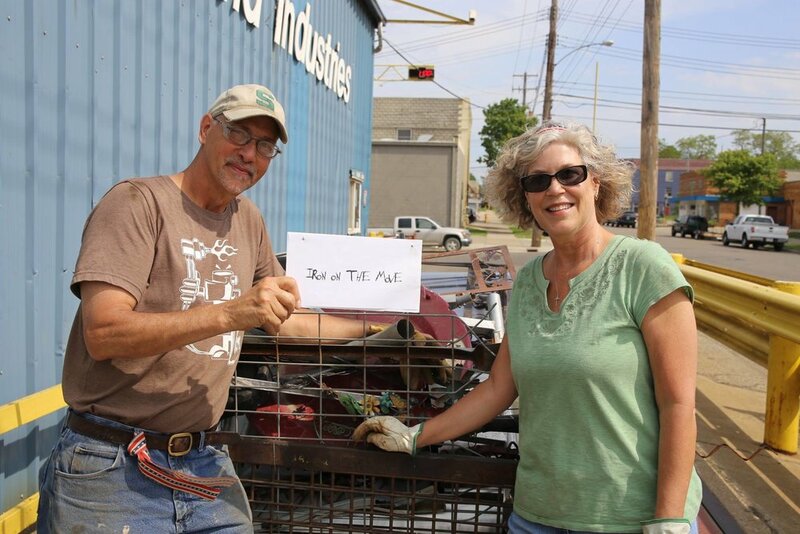 We’ve participated in Scrapfest during every year since its inception. Although we’ve learned fromour previous experiences and refined our techniques somewhat year by year based on said experience, our basic approach remains the same now as it was in year one. 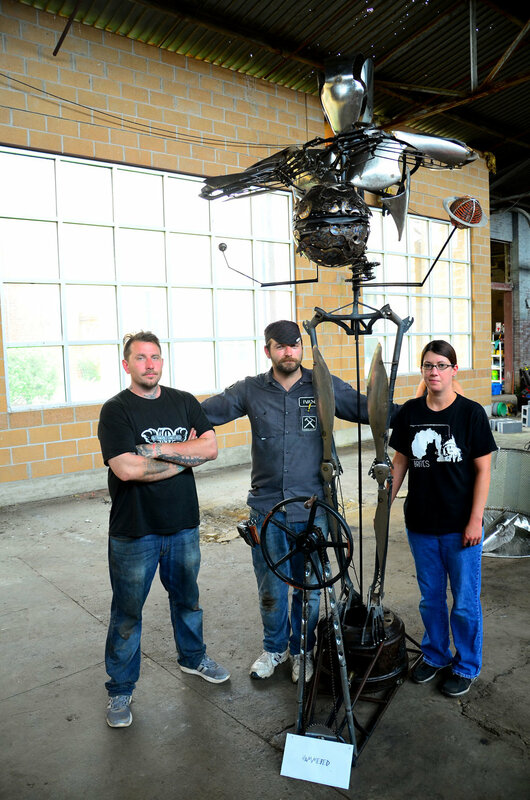 We’ve always viewed our Scrapfest sculptures as an exercise in improvisation, from start to finish. Rather than beginning with a preconceived idea of the finished piece, our sculptures first begin to take shape in the initial process of selecting their constituent scrap components, as certain pieces of steel suggest certain aesthetic and structural possibilities. These possibilities are then further explored; some rejected, some retained and then eventually executed as composition proceeds into construction. We’ve always rejected producing finished pieces that are strictly representational, preferring instead to work in the realm of the abstract, leaving it up to the viewer to decide for themselves what the piece suggests to them, leaving open an entire array of potential responses beyond mere recognition of a familiar shape, form or function. In this way the improvisational spirit in which the project begins results in an equally open-ended conclusion in the eyes and minds of those who view it. I have been helping my dad with Scrapfest for the last 6 years, but this year, I wanted to try doing my own sculpture. The inspiration for this piece comes from my own life, as I have just recently graduated high school and am hoping to be “taking flight” and leaving home soon. The bird is made from steel tread plate, and the nest is made from copper wire. The tree is constructed from various pieces of aluminum tubing, which led to me learning how to braze and then TIG weld. The base of the sculpture is an old brake rotor from a car, made of cast iron. 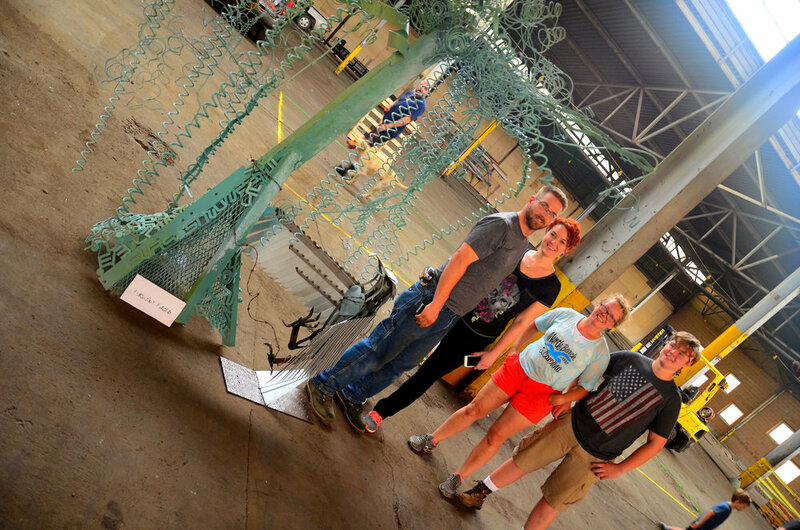 This is one of my favorite parts of Scrapfest, seeing so many different materials come together to make one piece of art. Late at night, if you listen closely, you will hear bass booming in the distance. You assume it originates from Spiral. You can’t see what happens beyond the fence at Friedland Industries, Inc. Abandoned machines & appliances rise up to embrace their transient independence. A brief moment to revel in freedom from the monotonous routine they were built to endure before being transformed into a new object. Welcome to the Marble-ous Dream Chaser! To begin, please pick up the marble and place it in the basket overhead. Perched up top, you will see the Dragon of Ambition. Under his watchful gaze, you will take your journey. As the marble clinks and glides through along the track, please keep an eye on it. This marble run doesn’t always work on the first try, and the tiny commuter may fly off in unexpected ways. You may have to try it a couple times, but when it works, it’s really quietly satisfying. Watching that little metal ball wind its way down through the Tree of Life is a 22-second meditation on harmony. It was built from bikes, barbecue grills and a building column. From fan covers, a computer and a frying basket. It grew from screws and solders and welds and bends and folds and good old fashioned improvisational engineering. It grew from teamwork and friendship. It grew from us. As you follow the marble through the final stretch, the Column of Humanity, remember your life‘s progress, ever forward through time. Sometimes things work out the way you want them to, and sometimes they don’t. There will be parts that needed to work perfectly to get you to the present, and there were parts that were little more than fanciful decoration. It all has a strange beauty. And then it will end. Watch as the ball nestles into its final resting place near silver platter. You may choose to leave it there, or pick it up and begin again. We hope you pick it up again. Furiously Forged is comprised of four members; Sabrina, Andy, Dione and Seth. We all share a common love of scrap art. We were inspired by E.Y. Harburg's quote, "My heart wants roots. My mind wants wings. I cannot bear their bickering". The tree is a weeping willow and signifies our roots, home life, and the sadness felt when it is time to let those we love go. The branches and trunk offered security and strength that sheltered and protected us during youth but now loom over us and leave us in shadow. The roots represented by barbed wire symbolize the devices once used to protect us that now serve to restrain our independence. The bird was built larger than life and signifies the final jump into young adulthood. We outgrow our home and our mind is racing with grand ideas of freedom. At the same time our hearts are torn by obligation and comfort of staying. We find ourselves in a constant battle with our heart and mind throughout life. We never really rise above the bickering. This sculpture started out with one of the early discarded designs I came up with while working on developing a prosthetic hand. Although this design did not work well for a prosthetic (because is was non-adaptive) I realized it would work great for a future kinetic sculpture, and there it sat on the back burner until now. We find the subject of how the universe, everything in it and how it works fascinating and hopefully our piece will spark your imagination in all kinds of ways to create new and amazing things. Our sculpture “Therefore I Am” is made up of things people throw away without thinking that their old bicycle could become something else that can make an impact on someone and contribute to the arts community. We enjoyed building the mechanics of this sculpture even though it was a painstaking process to get it all to work cohesively, it was worth every sleepless night. Place your phone, or small camera, on the shelf in front of our camera – we designed it to hold your device so you can be in the photo too! This project started as a sketch almost a year ago. The concept is an interactive photograph ‘booth’; an oversized frame showcasing a bench with a variety of words and props to create a fun environment. The focal point, the frame, was old pallet wood found lying around the scrapyard. It was rough and covered with dirt, so we cleaned it up and cut it down to a more appropriate thickness. The aged wood offers a wonderful contrast to all the smooth steel and bright colors. The rest of the piece, from the camera to the bench and the flowers to the stars, is constructed of a variety of discarded steel and household items. A pile of random cutout letters are now words that can be placed ‘into’ the picture, each with a simple mechanical device that allows it to move and stop as desired. Participants are encouraged to play with the words, carefully, to see is they can figure out how each one works. Lastly, get involved. Touch and play with the things we’ve created. Experience it and make memories. Scrap pick up day is always interesting! With three possible ideas in mind for a sculpture, we were able to find the perfect scrap for one particular idea; IT'S A BIRD'S LIFE. I started the project immediately, I cut and formed sheet metal to sculpt the birds body and neck. I was able to use threaded steel rod for the legs and I cut feathers from stainless steel and painted steel sheet. Then I blued some of the feathers to highlight the wings of the bird. The cattails were created with rusted pipe and I used twisted steel strip for the reeds surrounding the bird. Our work is inspired by our values—maintaining a balance of health, work, play, and spirit to live a sustainable lifestyle. By honoring our values, we playfully create multiple styles of mobiles and enjoy sharing these mobiles with others. When we don’t honor our values, we are unbalanced like an off-kilter wonky mobile. Our initial aim was to collect materials that would lend to creating a kinetic piece. We decided to construct a light and lyrical sculpture and stay away from forging a cumbersome and static piece of art. While we find beauty in heavy steel sculptures, they tend to weigh our souls and our spirits down. Our goal was to capture the eye of the viewer with glistening material in motion. Stainless steel is a supreme medium. Once burnished, it becomes a mirror in the natural environment that reflects the colors of the sky and its surroundings. The title for this piece is Willet. Willet has multiple meanings but seemed to fit described as a large shorebird in the sandpiper family. Even though willets (Tringa semipalmata) have long moving shanks, they tend to nest low to the ground in short grass. This description aligns to how we envision our Willet—laying low in a lush garden swaying its limbs in the wind. This Knight is sure to steal your imagination and run wild with your dreams. We have always loved the strength and freedom that the horse represents. What better way to honor those traits then to capture its raw beauty and immortalize them in steel. My team and I hope we have accomplished our goal and imbedded the spirit of this noble animal into our piece. We enjoyed working on this sculpture and we hope you enjoy it to. What do you imagine in the ocean’s depths? Artist Patrick Kelley envisions a giant octopus floating quietly in swirling ocean grass, until a small time-worn yellow submarine happens into its realm. Curiosity awakens the gentle giant and arms reach to explore. 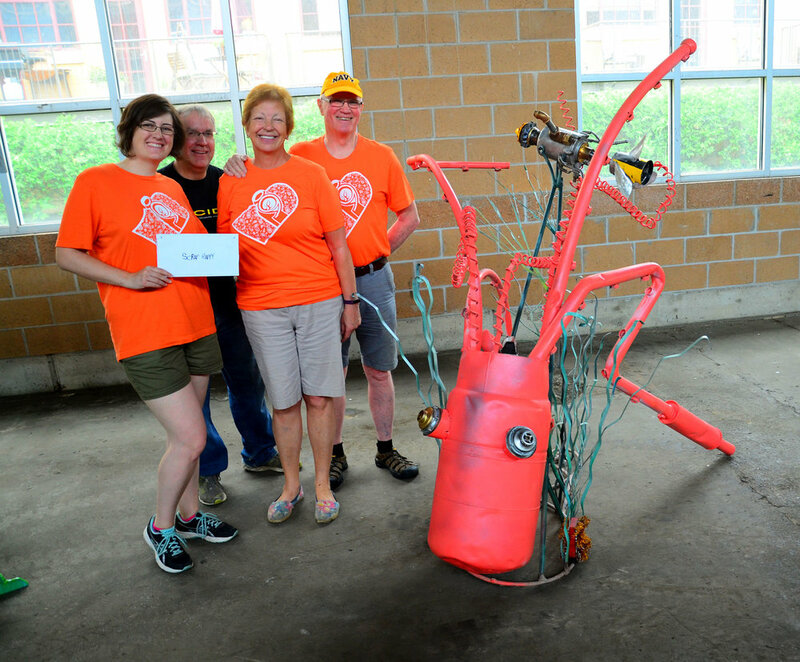 Team Scrap Happy used Patrick’s vision to create our sculpture “Curiosity”. 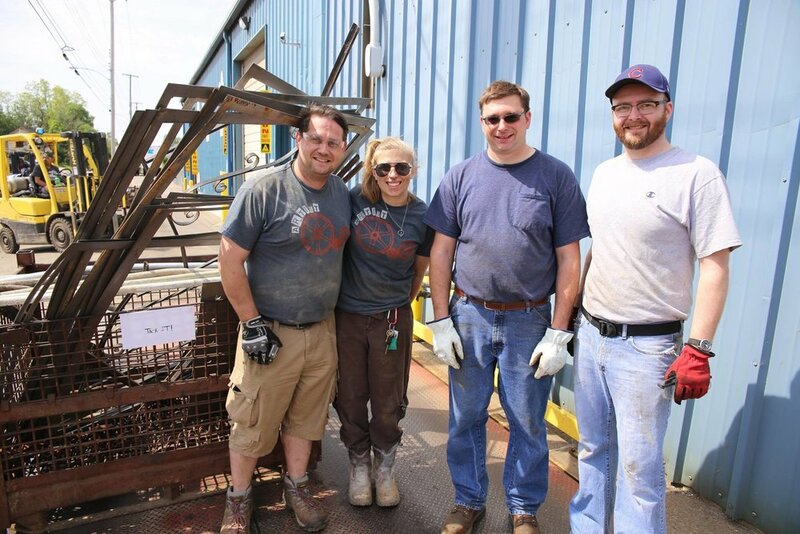 Our team worked together bending, cutting, sanding, welding, and painting to bring the curious octopus to life! We hope you enjoy our little piece of the ocean! Van Gogh was obsessed with the colors of the starry night. As welders, we rarely get to display the wonders that lie beneath the paint. What you see is raw and unfinished, and displaying the beauty of the process. We used Tig and a little mig welding to paint a canvas of stainless steel. We obsessed over a natural "welders palate of colors" and different metals to achieve the look. We hope you enjoy it as much as we do. Thank You. This is our second year participating in Scrapfest and it's a great opportunity to try new things. Making art from scrap shapes each piece so much; even with many teams coming to the same show each year they end up with totally different works of art. That’s one of the things that intrigues us the most: the art is shaped by the recycled materials it’s built from just as much as it’s shaped by the artist. 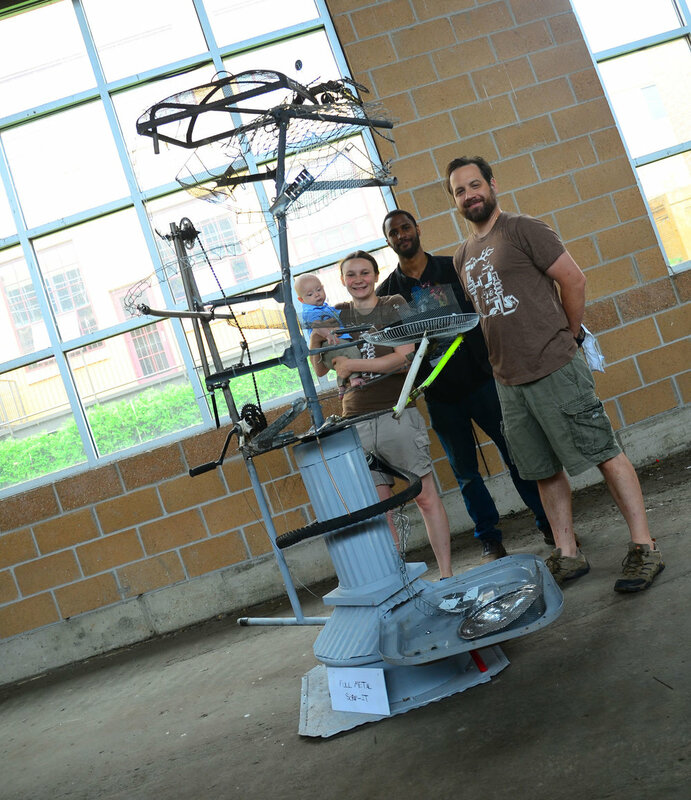 This year's piece was inspired by the tool that persuades metal the most: the hammer. We wanted to do something oceanic though. So we combined these two ideas into a hammer head shark. 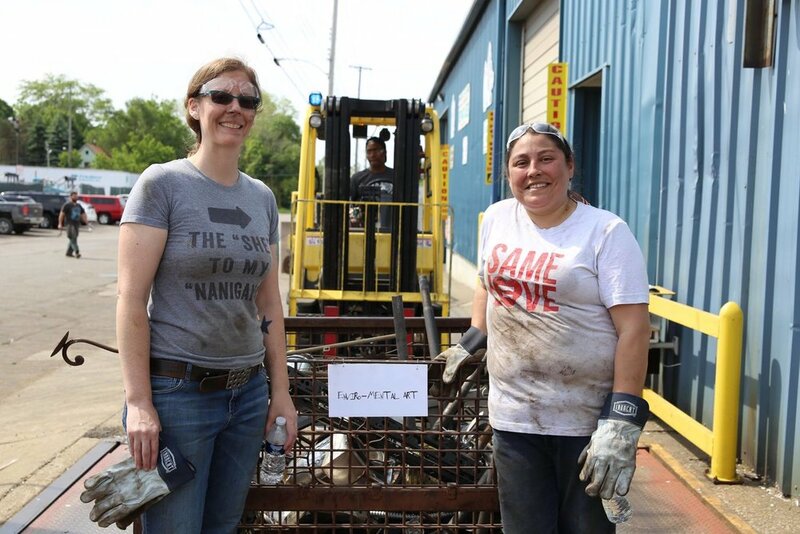 We weren't sure how big or what we could make it out of until we collected the scrap. 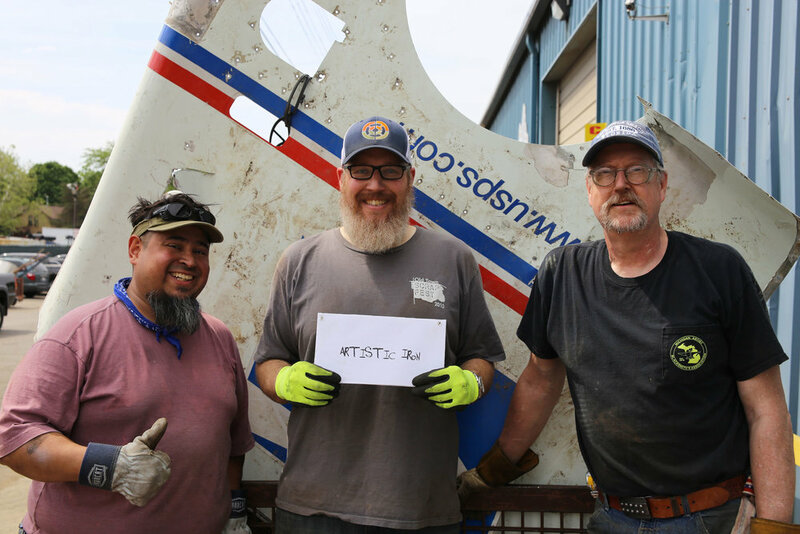 We weren't sure how we were going to display the shark, then the scrap showed us the surfboard, and off we went. We made the board, we started rolling what looked like tomatoes cages to form the body, and applied the skin. Then the toughest part, making the thing move. 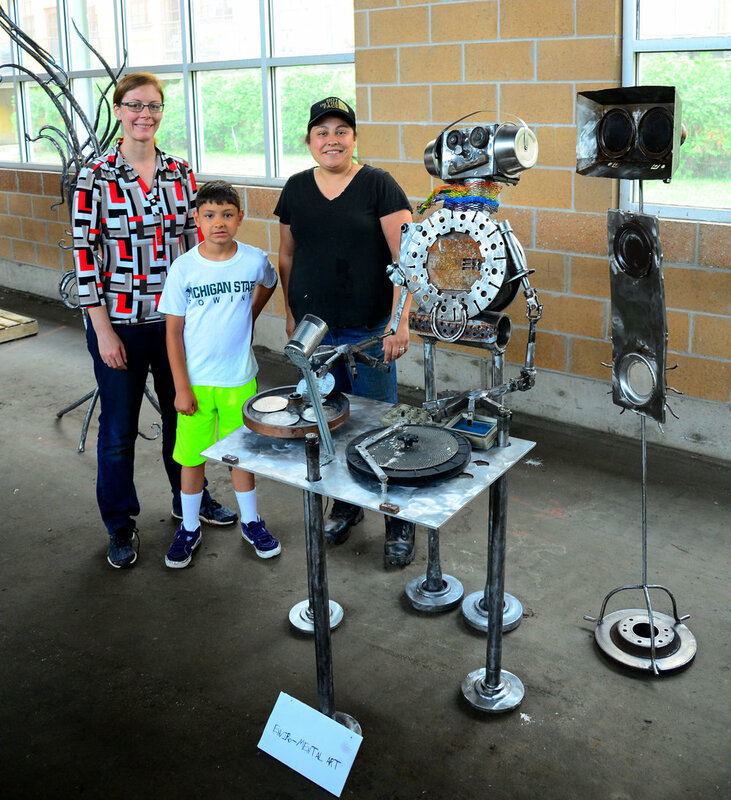 The sculptures at Scrapfest of years past were the inspiration in making this year's artwork kinetic. We had collected 5 motors from the yard, only 3 worked, we broke one by dropping it, we ended up having to use a box fan motor, and we had to gear it down. We used bicycle chains, gears and inner tubes - all to make the tail wiggle. We think it's a little like Jaws! This year brought many challenges. We struggled with the mechanical aspect, with gear reductions, armatures and linkages. Both team members' lives got in the way of this year's piece. We both have full time jobs, and we had family commitments to manage. With all that was up against us, we still managed to pull it together this year and make something we can be proud of. 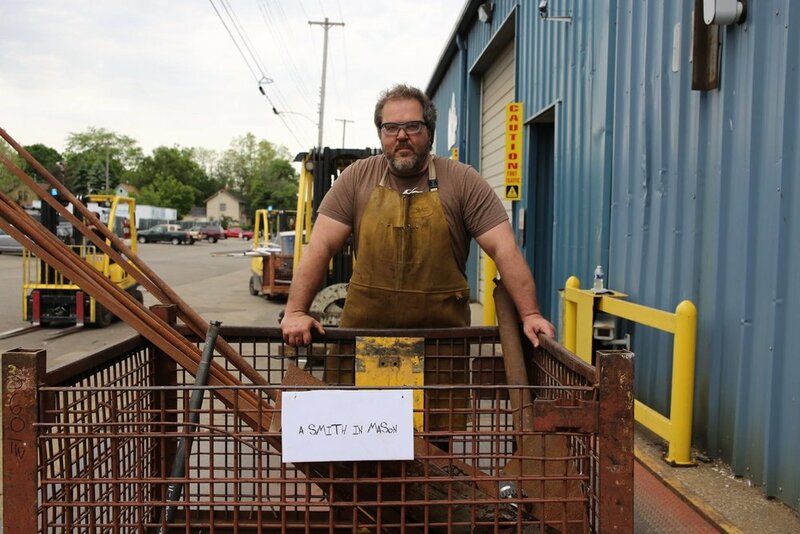 We are passionate fabricators finding beauty and purpose in discarded metal parts. Rooted in automotive and art culture, inspiration is all around us. We strive to engage the viewer’s heart and sense of wonder. Projects often have recurring themes of fantasy, nature and spirituality. We drew alot of inspiration from eastern architecture. Working with geometric shapes was a challenge for us because our designs haven't incorporated using the materials in this particular way before. The archway could be functional as a trellis for climbing plants or left as a focal point in your yard or garden. Relax in this cozy seat for two as you enjoy our beautiful Michigan summers! Please enjoy this unique and fully functional, octagonal fire pit. The fire box walls are intentionally slanted as this shape is ideal for reflecting heat. Made from heavy gauge stainless steel, the box will last for decades. In the center small salvaged pet food bowls provide a lid to an air duct drain. The mosaic top contains a cornucopia of scrap and serves as a kind of heat blanket, holding warm air around your legs, as you and your guests sit by the fire. Scrap used includes old engine parts, sprockets, armor plate bits, and even a few discarded hand tools. Can you find them?